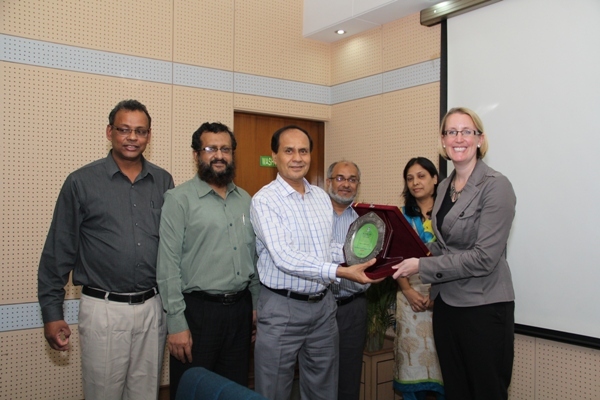 Ms. Sarah Cooke,Country representative, Department for International Development (DFID) Bangladesh visited PKSF on 14 October, 2014. She led a team that included Ms. Shahnila Azher, Team Leader, Private Sector Development, Mr. Graham Gass, Team Leader, Extreme Poverty, Mr. Arifur Rahman, Livelihood Advisor, Mr. Roqibul Islam, Programme Manager and Dr. Reazul Islam, International Team Leader of Project Coordination Unit of PROSPER. The DFID team made a courtesy call to Mr. Md. Abdul Karim, Managing Director, PKSF. There, they briefly discussed on the issues of bilateral interest. Then the formal meeting took place with PKSF’s higher management and representatives of some selected Partner Organisations (POs). Chaired by the Managing Director of PKSF, the meeting was attended by Mr. Md. Fazlul Kader, Deputy Managing Director (Operations-1), Mr. Golam Touhid, Deputy Managing Director (Operations-2), Dr. Taposh Kumar Biswas, Director (Research), Mr. Mohammad Hasan Khaled, General Manager (Audit) and Mr. A.Q.M. Golam Mawla, General Manager (Operations) and other higher officials of PKSF. Representatives of the Partner Organisations included Executive Directors of Uddipan, CODEC and Wave Foundation and Director of Jagoroni Chakra Foundation. Mr. Md. Abdul Karim, MD, PKSF made a brief introduction. He referred to the historical relationship between Bangladesh and United Kingdom and commended UK Government’s sustained support in the development efforts of Bangladesh. Mr. Karim expressed his sincere gratitude for the DFID support in extreme poverty alleviation programmes: PROSPER (PRIME & LIFT) and the Climate Change Resilience Fund (BCCRF) initiatives of PKSF. This was followed by a presentation by Mr. Golam Mawla on PKSF, especially on activities related to extreme poverty and climate change. The presentation specially noted how PRIME, through its micro-credit based financial and non-financial supports, helped over half a million households in alleviating their extreme poverty situations. It emphasized that PRIME model should be replicated to address the other extreme poor families across the country towards meeting the UN Post-2015 Development Agenda. 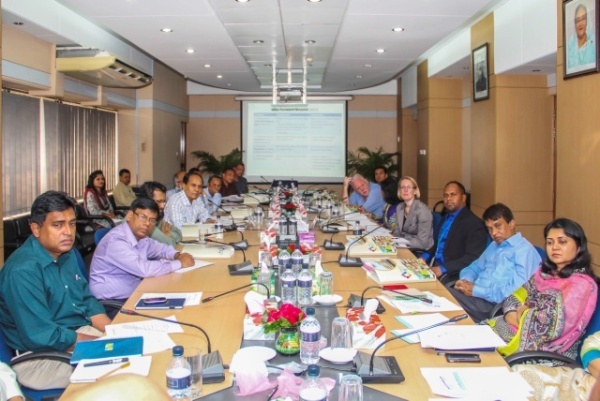 Ms. Cooke especially thanked PKSF for generating an in-depth database on the state of extreme poverty of Bangladesh and emphasized the need for the best utilization of the available PRIME data to design future extreme poverty programme not only for PKSF but Bangladesh as a whole. The DFID team noted that they are now in a phase of formulating new extreme poverty programme, where PRIME lessons would be very useful. The DFID team members also emphasized on the need of integrating PRIME lessons with the lessons of other similar programmes of Bangladesh. The DFID team appreciated the activities of PKSF especially those under PRIME. It enquired whether PKSF can participate in multi-donor funded possible future extreme poverty alleviation intervention of DFID. PKSF’s response was affirmative in principle. Mr. Karim mentioned that initially PROSPER programme itself was a multi-donor project. In addition, PKSF has already implemented such programme. Finally, Ms. Sarah Cooke thanked PKSF management and its working partners. The meeting was followed by lunch hosted by the courtesy of Dr. Q. K. Ahmed, Chairman, PKSF.